Greetings and Happy New Year, my dear blog readers! I hope you all had a lovely and tasty holiday season! I know I did! Here’s to a new year with more delicious recipes and sharing the foodie love all around. If I could, if I could convince myself it was acceptable, I would eat these all the time, y’all. I love them. Because I love them so much, I’m excited to share them with you as well. Because I also love you all, I will admit up front, these should not be eaten willy-nilly. I did go through a phase when I made them nearly weekly. That time in my life is past, but these do come out on nearly every special occasion. Birthday? They’re on the menu. Celebrating a promotion/getting a job? On the menu. Having friends over for a holiday appetizer party? Definitely on the menu. Fourth of July meal at my dad’s? Absolutely on the menu. In fact, that’s where I first had them. He has this gizmo where the peppers rest upright in the grill, which changes the whole approach. As I don’t really grill (yet), I had to modify my strategy. Plus my sister and I both agree that limp, half- cooked bacon is not good eats and can ruin the whole thing. Thus, it is important to me to have crispy bacon around the whole pepper. I think I have achieved a near perfect jalapeño bacon bite, which I believe you will enjoy. It is more of a method than a recipe, so feel free to adjust as you see necessary. If you feel the need to make a test batch before you debut this for company and you end up scarfing the whole lot of them, I won’t judge you. Just make sure you have company coming for the next go-round. 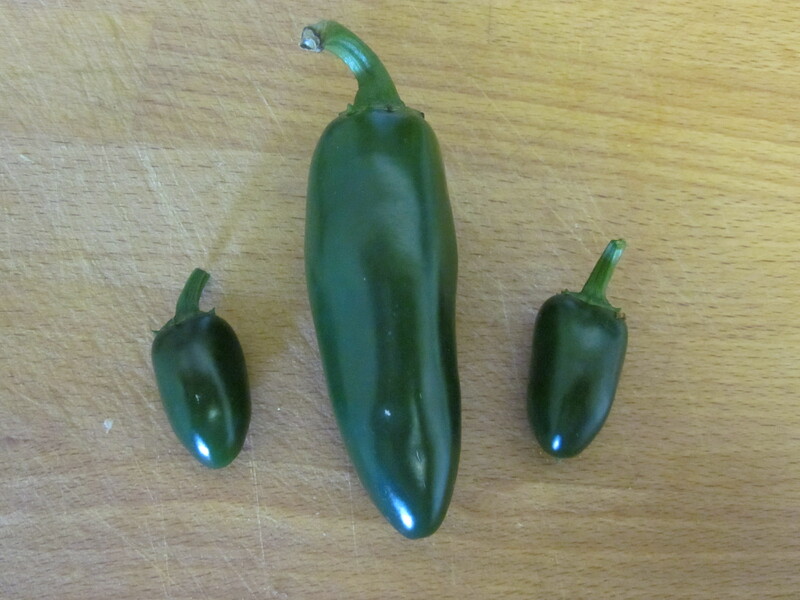 Jalapeño Peppers – Each pepper makes about 4 bites. I usually use about 1 or 1.5 peppers per person. Estimation is fine. 1. Set your cream cheese out to soften. I usually set mine out 15 or so minutes before I begin the pepper prep. I know it’s already soft, it’s just easier to stir in the spices when it’s super soft. 2. 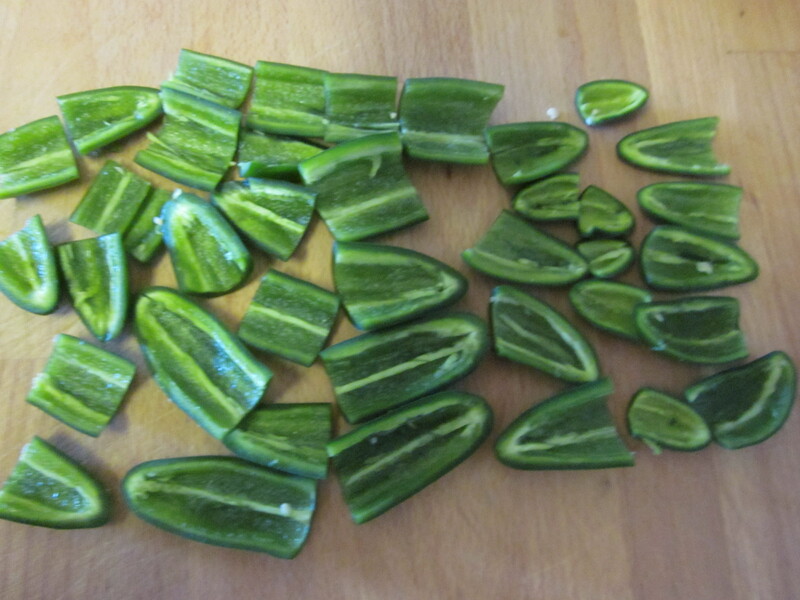 Don your trusty rubber gloves, and for each pepper, cut the tops off, and slice in half, lengthwise. Seed and cut out the ribs, according to your preferred heat preference. The more seeds and ribs of the pepper you leave in, the hotter the bite is likely to be. Cut the pepper “boat” in half again so you have 4 quarters per pepper. * Continue until all peppers are prepped. 3. 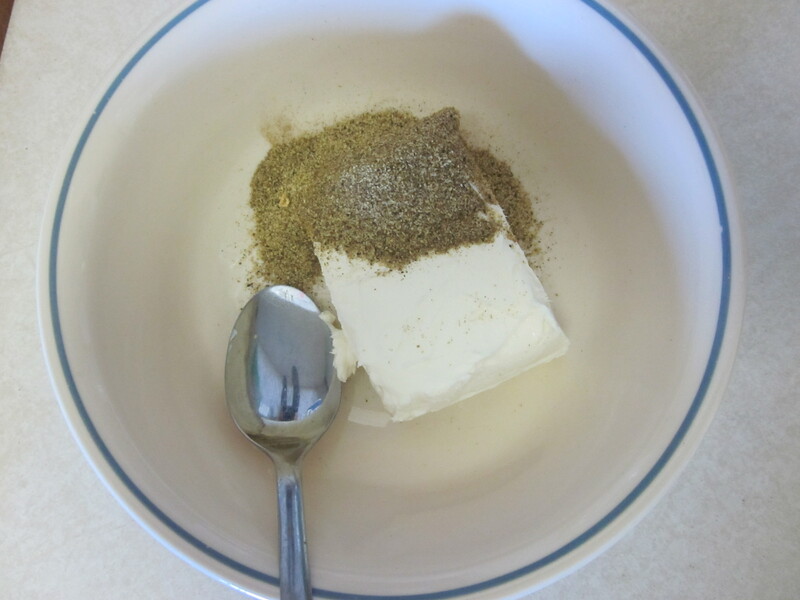 In a bowl, mix your cream cheese and Adobo seasoning. 4. 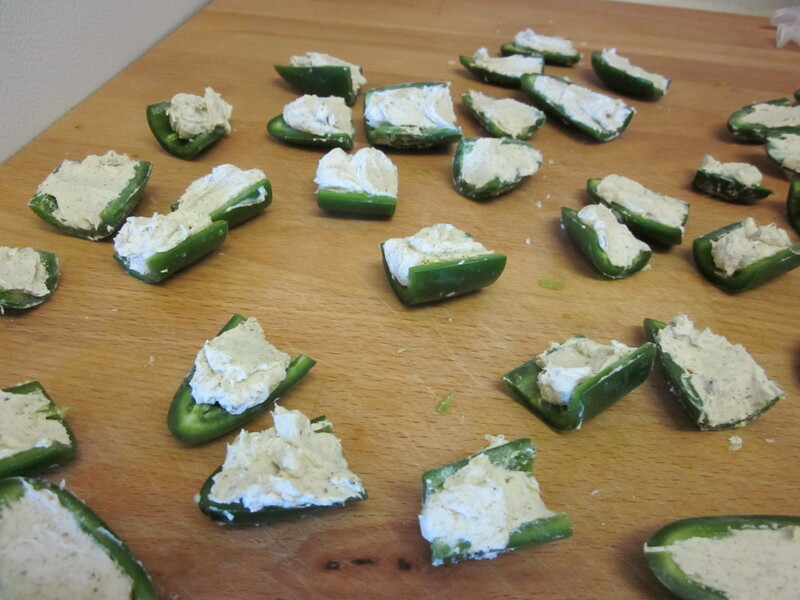 Using a butter knife (and leaving your gloves on), fill each pepper piece with a dollop of the cream cheese. It doesn’t have to be tidy. You want to make sure the dollop at least comes even with the edge of the pepper. Repeat for all your pepper pieces. Leave the gloves on because your fingers will get right messy holding those wee pepper pieces. 5. Preheat your oven to 450 degrees. 6. 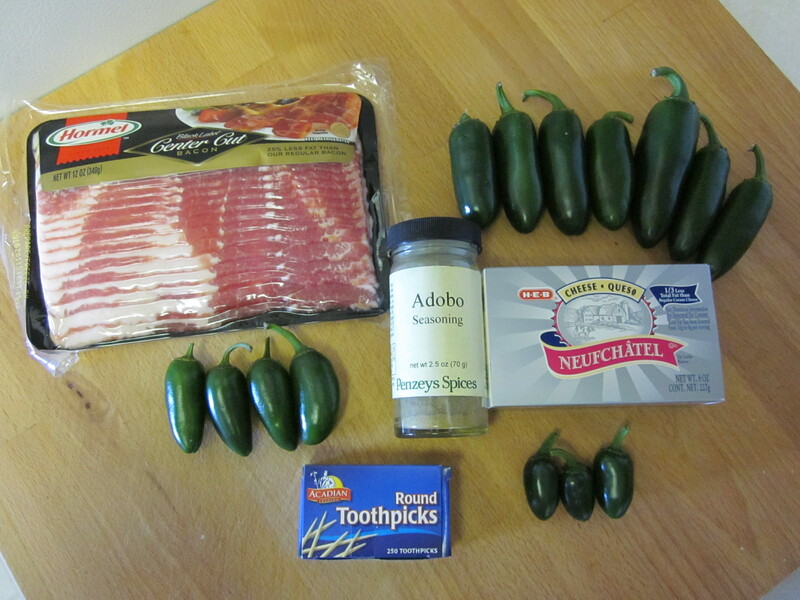 Using some kitchen shears, cut your bacon into thirds or quarters, depending on the size of your peppers. Test cut one piece before you cut too many slices. I cut two slices of bacon at a time. 7. 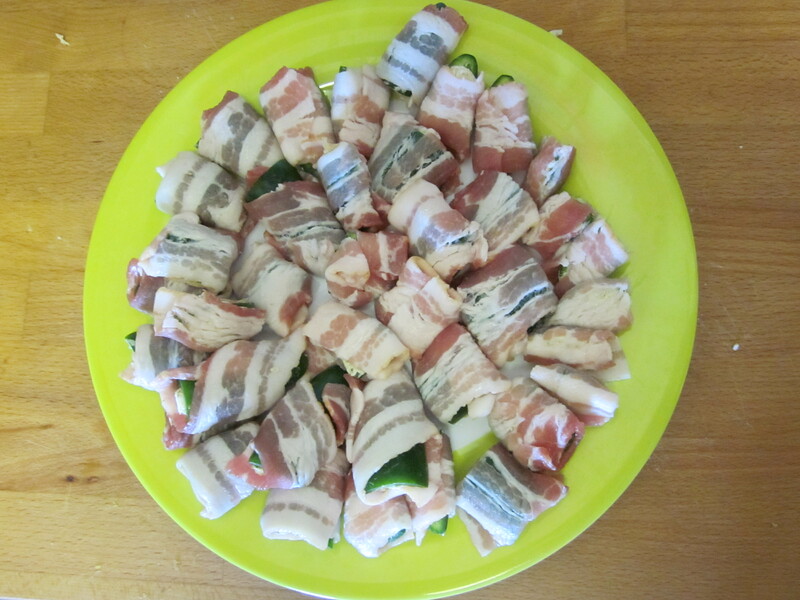 Wrap a piece of bacon around your cheese-filled pepper piece. The great thing about bacon is that it stretches. This will work to your advantage. Wrap the bacon piece so that it covers the open ends. I wrap all mine and then secure each one with a toothpick. 8. Line a jelly-roll pan (a cookie sheet with sides) with foil (for easy clean-up), and place a cookie cooling rack on it. Your wrapped bites will go on the rack. They don’t need a super lot of space between each one, but they shouldn’t be touching. 9. 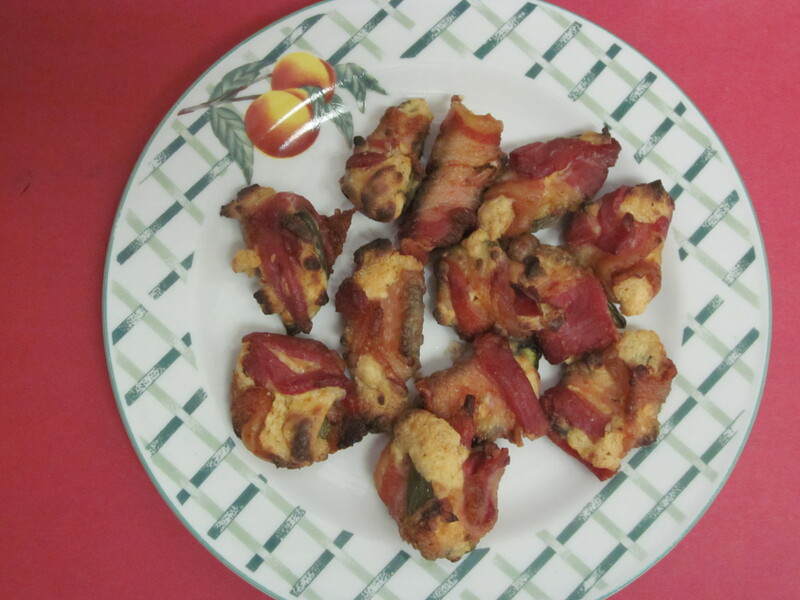 Bake until the bacon is your desired crispiness. This could take 20 – 30 minutes. My personal desired crispness takes about 22 – 25 minutes. 10. Do NOT eat these straight out of the oven. They are boiling-lava hot and will scald your tongue. Let them cool before you enjoy. If you are anxious about your toothpicks being in the oven on such a high temperature, you can set them to soak in some water before you start the whole process. Just know that when you put them in the oven and things begin to cook, there will be a lot of sizzle and snap as the oil and water fight it out in the oven. No harm will come to anything or anyone (as long as you keep your hands out of it). It’s just what those two do when they come into contact like that. Alternatively you can leave the toothpicks dry and just check on them. They may char, but it’s highly unlikely they’ll combust in your oven. At least mine didn’t! *An additional alternative method is to save the quartering of your peppers until after you’ve filled them with the cream cheese mixture. I’ve done it both ways and think maaaaybe it saves some time to fill the larger halves of the pepper before slicing into quarters, but I can’t be certain as I’ve not actually set a timer. I suppose it just comes down to personal preference. It’s your kitchen, and you are the boss of it, so you do what makes you happiest! 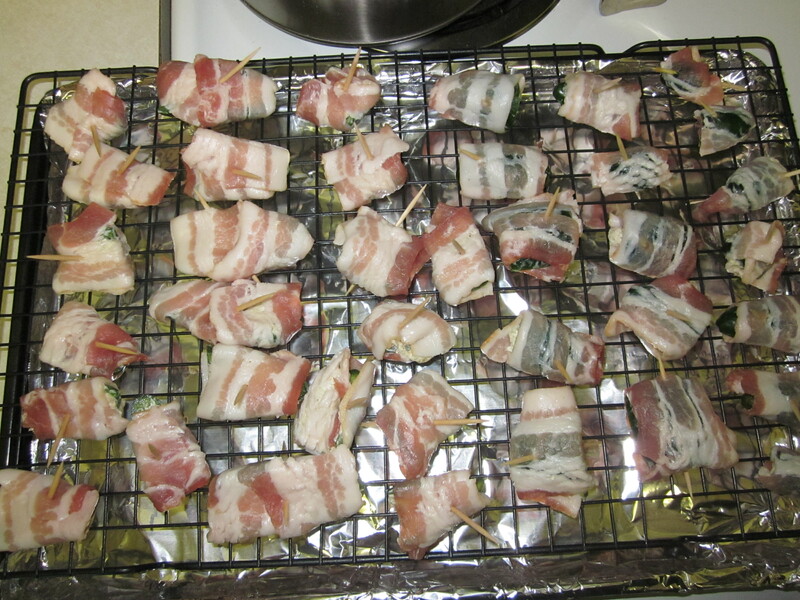 Any bacon that is leftover you can wrap and freeze for a later date. I had a few strips leftover so I just tightly wrapped them in plastic wrap and popped in them in a zip-top freezer bag. It’s important to wrap tightly to protect from freezer burn. Bacon is another one of those meats that defrosts super quickly when it is only 2 or 3 slices thick per personal package. These smaller packages are perfect for the single cook who won’t be defeated by packaging meant for a family of 4 – 6. I’ve taken to separating a larger package of bacon into the smaller units much like I do chicken or ground beef. Alternatively you can buy bacon by the slice at the deli counter, which also eliminates waste and allows you to buy precisely as much as you need. However, I think it might be more expensive and sometimes…sometimes it’s early on a Saturday or even mid-day on a Sunday, and you want bacon but have none, and the thought of a trip to the grocery store is murderous. In that moment, my friends, you’ll be thankful for your single-serve packages of bacon in your freezer. I know I am. I hope you enjoy the jalapeño pepper bites! Make some just for yourself so that you can get them just right and then share the tasty tidbits with your friends at your next shindig. They will be most grateful! 🙂 Happy eating! Karen I was just bragging about these to the newer folks at the office. I remember a weekly period for these with you. Those were the days. YUM!